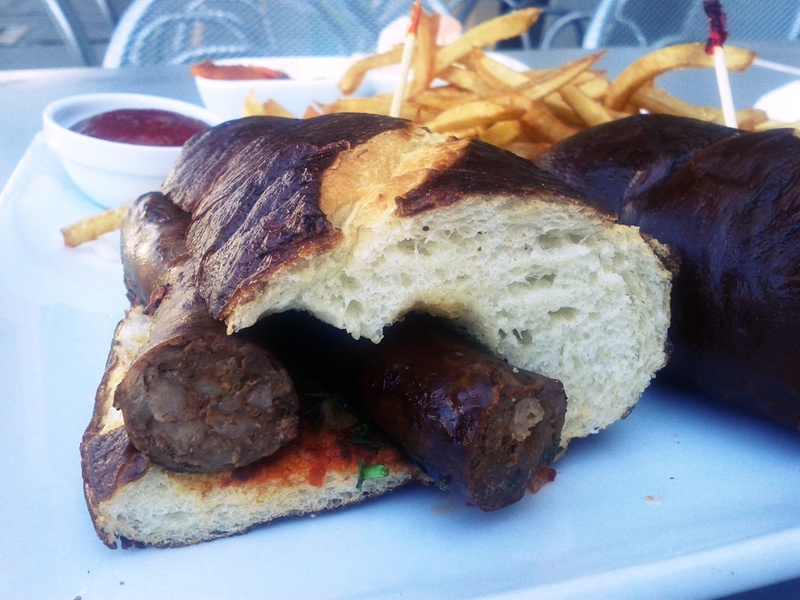 Merguez is a North African sausage, and the type on offer here is beef, flavored with fennel and cinnamon. That goes on a pretzel roll with harissa, a chili pepper spread that’s really quite delicious, chopped parsley and onions. It’s a simple sandwich, as I believe a good sausage sandwich should be. But the thing about simple sandwiches is that there’s less room for error. Got Kosher makes their own sausage, their own bread, likely their own harissa as well. I like establishments that do that, both because it makes things more likely to be delicious, and when things fall short I know exactly who is to blame. In this case, the pretzel roll was delicious but the sausage fell short, leaving this sandwich as something less than a success. It’s possible for great bread to carry a mediocre sandwich, but not when there’s this little to back it up. The harrisa was also good, bright and flavorful, but the sausage was dry. It would be tempting to blame the dryness of it being beef, as opposed to pork or some other more moist meat, but the whole point of sausage is you have perfect control over how much fat goes in! If you stuffed it and you cooked it, you’re all out of excuses. The pretzel roll really was very good, and should I find myself back at Got Kosher I’ll be glad to try something else on the same. It had a deep brown crust and a strong malt flavor, making it all the more sad that the sausage couldn’t keep up its end of the deal. This entry was posted in Sandwich Reviews and tagged Beef, Los Angeles, Reviews by Pete, Sandwiches I Have Eaten, Sandwiches Made For Me, Sausage by Pete. Bookmark the permalink.